Knitting at least one a day is working really well for this project and I'm delighted to have broken the 100-barrier, which feels like a significant milestone. Over the weekend, I also managed a little bit of work on the Sitting Room Circles Throw which doesn't actually look much bigger than last week, and is now probably about 1/8 of the necessary size. 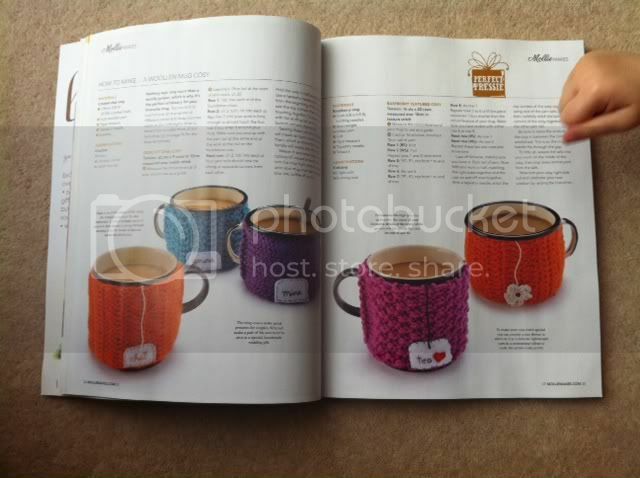 That's it from me, but I've just received my latest subscription of Mollie Makes where there are some cute little knitted and crocheted mug cosies so I feel a quick fix FO coming on!!!! Don't forget to check out the other WIPs via Tami's Amis. I agree that breaking the 100 barrier is a significant milestone! I'm looking forward to seeing what you make out of the hexipuffs. WOW you are flying along on the hexipuffs! They look great. I love how you announced the number of puffs in the photo, that made me chuckle ;) Definitely seems like a significant milestone. Congrats on breaking the 100 barrier! Your circles look great, too. I think a mug cozy is definitely a nice short project to accomplish in between your large projects. Yay for a zillion (that's code for 102) puffs! But I have to say, I'm completely smitten with the colors of your circles. They're gorgeous! I agree it is nice to have some quick fix crochet on the go isn't it, it is what makes me tick I think. The circles are lovely, they remind me of something for a split second as I see them, but I can't put my finger on it. The colours are gorgeous. D'you think there are more stashed hexipuffs still to be found? Wow, you inspire me to pull out my hexipuffs again. I was on a one a day pace but that turned into a two a weekend pace somewhere along the way. Breaking the 100 puff mark is a milestone. Congrats!!! I also love the colours for your sitting room throw. Can't wait to see that finished. Congrats on breaking 100!!! I don't envy the thought of sewing them all together though - is there an easy way to do that? I spotted your little helper too - how cute!!! Sweet hexipuff pic! 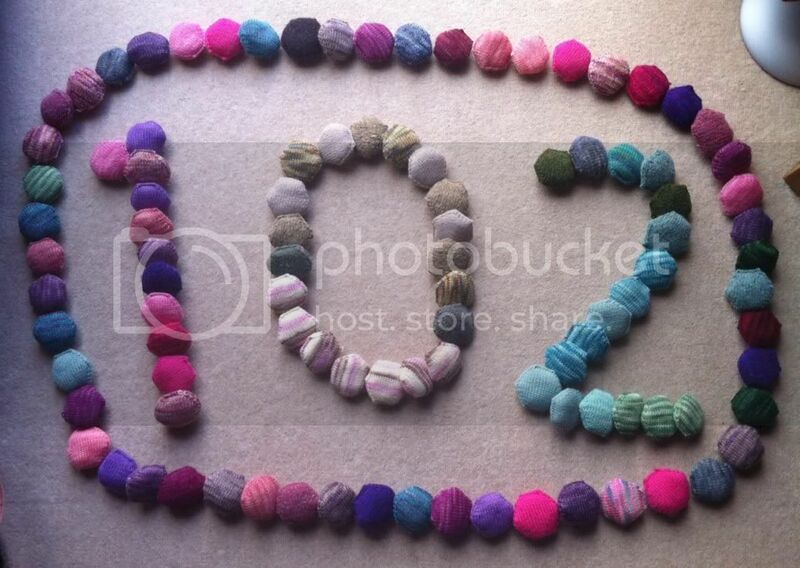 102; OMGosh, that is many! Love the blues and pinks and purples. 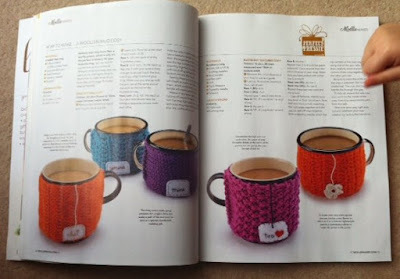 That ad really makes mug cozies look so cute. Yay for more than 100 hexipuffs! 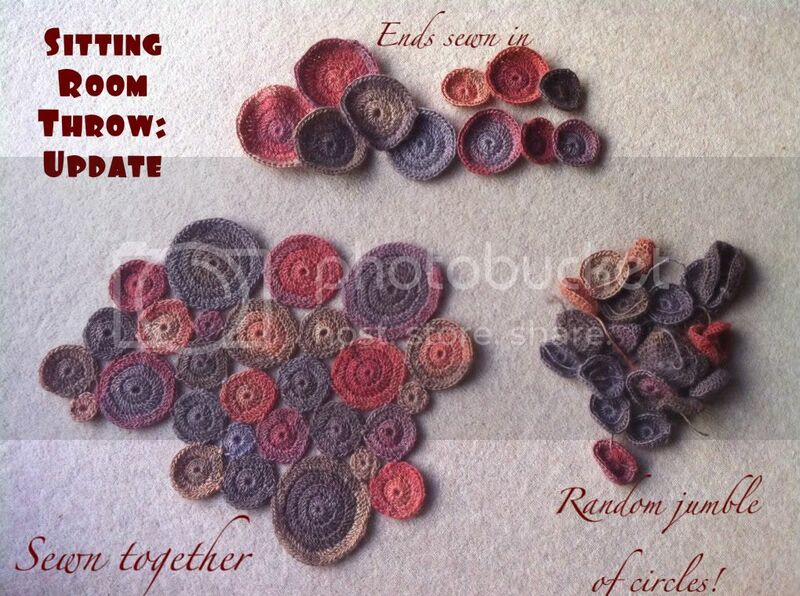 And the circles throw is going to be amazing - love the colors. WOW, that's a lot of hexipuffs! I keep seeing them popping up on many blogs I read and thinking, "I have to get in on that!" Also, the mug cozies are ADORABLE. Grats on knitting so many hexipuffs! That's a really good goal...one a day. When I first looked at the beekeeper's quilt I wanted to knit it but figured I'd never finish. But if I looked at it the way you are, I'm pretty sure I could do it, too.